I remember when the first discussion of intrinsically photosensitive retinal ganglion cells (ipRGCs) started coming out. My thinking at the time was: “Wow, cool concept… but how in the world could you stack enough opsins in two membranes to make for any psychophysical perception?” In short, despite some years of predicting their presence, I did not buy it until the number of papers coming out made it impossible to refute. Now we have different classes of ipRGCs with multiple targets and the whole prospect is really interesting. A couple of months ago, King Wai Yau gave a talk here at the University of Utah where he talked about some of his work and the number of ideas that came out of that talk were amazing. The idea that there are parallel pathways to conscious vision have been around for some time (blindsight etc…), but new work suggests possible image forming roles. We’ve had a chapter in Webvision on melanopsin ganglion cells by Dustin Graham for some time, but this review by Gary Pickard and Particia Sollars also does a pretty nice job of summarizing ipRGCs, the discovery of melanopsin, its comparison of invertebrate and vertebrate photoreceptors, the mechanism of drive and some description of subtypes as well as current progress. 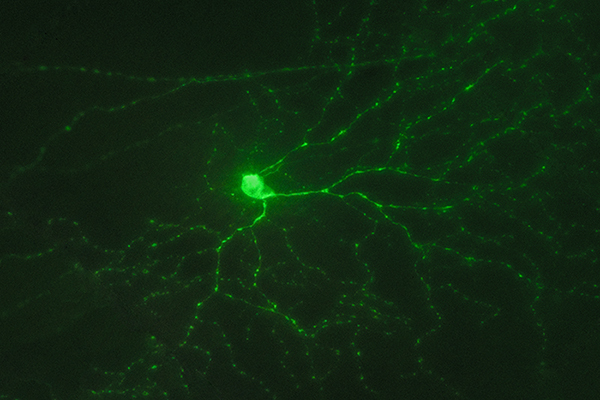 Image credit: GFP positive ganglion cell provided by Ning Tian, M.D., Ph.D., photographed by Bryan William Jones, Ph.D.